Life in BG » What’s For Dinner? While we were in the U.S., we found that most people were curious just about our day-to-day living. Sure, the adventures are funny (to some….not always to us…. ), but really y’all just want to know what life is like. The picture really does not do justice to how small the thing really is. 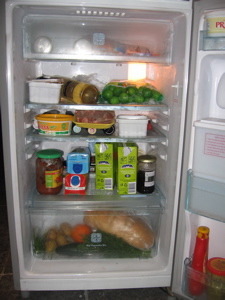 You can see the basic contents: limes we smuggled in, two green cartons of milk, two small cartons of juice, some meat and cheese, produce and bread in the bottom bin, butter, a white container of raspberries and a white container of leftovers from last night, etc… The fridge holds a couple of days worth of food. If I’m lucky I can make it a whole week. But usually, because the produce and bread are fresh when we buy it, the food itself only lasts a few days anyways. What is it?, you ask. 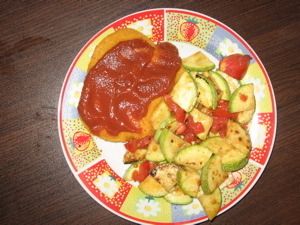 It is a breaded fillet of chicken with tomato sauce and sauteed squash and (you guessed it) tomatoes. Did I mention what a staple tomatoes are here? My lycopene count is HIGH! 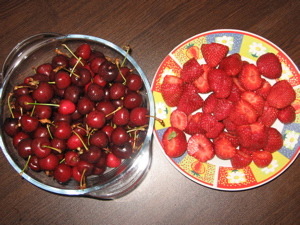 These are the cherries and strawberries I bought yesterday, cleaned up, sliced and are ready for eating. Altogether, all the fuits and vegetables here cost about $1.75. Yes, you read right. $1.75 for the squash, tomato, kilo of strawberries and kilo of cherries. This, of course, excites me far more than it does Mark. He’ll eat everything but the cherries. he doesn’t like them. Heh. More for me, I say. Hey…this place is often a lot like Santee. Scary. feels like old times, especially last night when I ate tomato slices, pasta with butter and strawberries. Now that’s a meal!